That’s right guys, there’s TWO posts today!! That’s because I have some very exciting news! Noooo, nobody is preggers…but I do have another project baby! 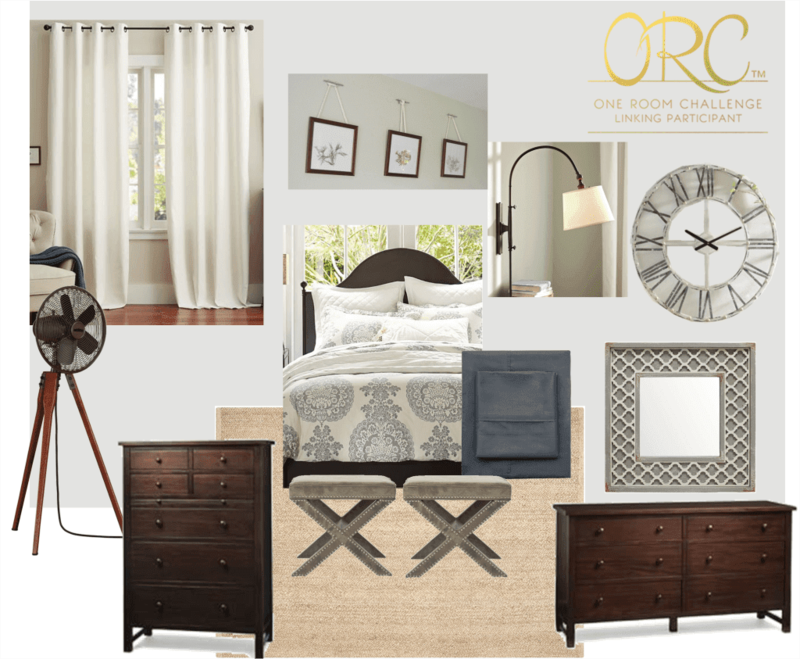 I’m happy to announce that I will be putting my rapid-fire-makeover skills to work to take part in the One Room Challenge as a linking participant, making over our master bedroom!! 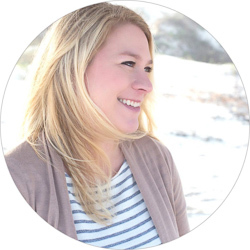 If you’re unfamiliar with the ORC, it is organized by the crazy talented Linda at Calling It Home and has twenty designers who completely redo a space in their home in just SIX weeks! You won’t want to miss their amazing transformations and each Wednesday they’ll all be posting their progress. But on Thursdays, us bloggers can also participate and share our own ORC room transformation! We, too, have six weeks to transform a space in our home, start to finish. So, ladies and gentlemen, today is Week One and I will be introducing you to the space I’ve chosen to take under my wing. 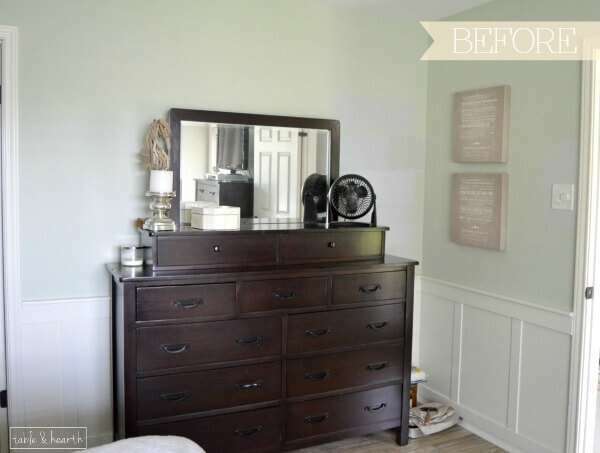 If you’ve been following for a while, you’ll remember that I threw out some ideas of changes I’ve been thinking about for our master bedroom. Well, it’s time they started happening, and what better time than during the ORC?!? 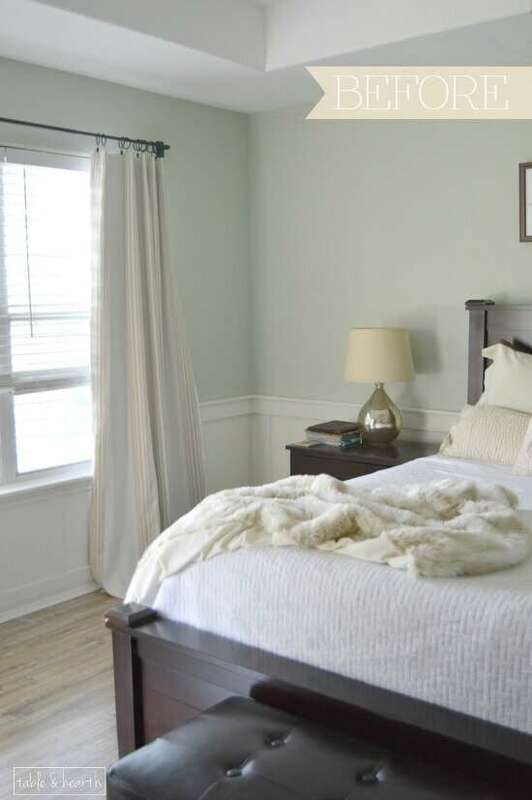 I’ve focused on getting the other two bedrooms (here and here) and bathrooms (here and here) just right in our house but our master bedroom has sat idle for the past few years and it’s just not the cozy, relaxing space I dream about. So, let’s look at where we’re starting shall we? Eeeesh, don’t look at this one too long please. I’m ashamed this photo is on the internet once again! This is our “master” bedroom almost exactly three years ago. We’d been in our house TWO YEARS and it still looked like this! And the walls had just gotten painted here. Luckily soon after this we upgraded to a king bedroom set and got rid of that carpet, phew! Ok, muuuuch better. Here’s where we are today. 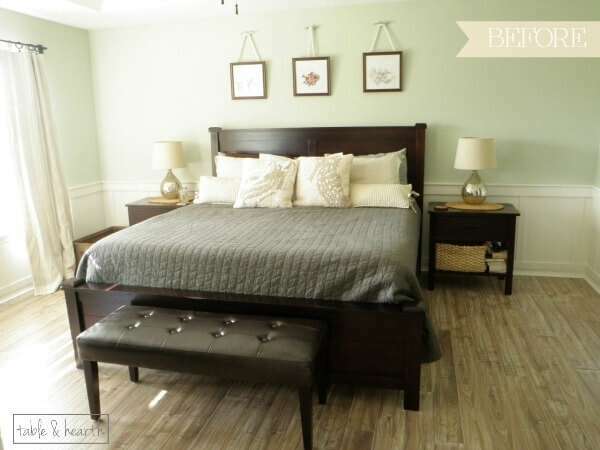 A nice dark wood king bedroom set, driftwood laminate handscraped flooring, and DIY wainscoting. 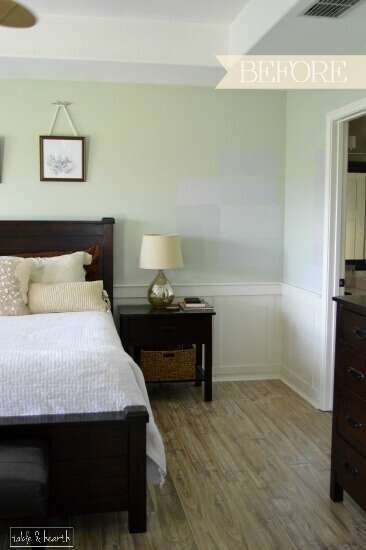 While I love these elements, I am tired of the green and tan and the space just still doesn’t feel “done” to me. I desperately want to put a jute rug under the bed and that want has finally outweighed my cat-puke fears, I can’t resist it any longer. I’ve tested out a dozen handful of possible paint colors but they all looked purple-ish next to the green. I was looking for a very light, unsaturated gray with a tiny hint of blue. I finally found a winning color but not before going through even more samples and a frustrating-but-necessary step before finding it. You’ll hear all about that next Thursday in Week 2! There’s still alot of open wall space in here that I’ll need to work on. Every time I try something by the windows it feels too busy to me. I also need to give our nightstands more oomph and decor, especially when I switch to the sconces. I’m hoping they’ll take up some of that open space on each side of the bed and also draw the eye upwards. The bathroom wall with our wide dresser is the biggest problem area for me :/ Again, lots of open wall space and boringness. This area will be getting a big overhaul in the decor arena ‘fo ‘sho. My pressed algae prints hanging from boat cleats above our bed will stay, they’ll just be getting a nice facelift to give them more of a presence and pop. Unless I can find matching 16″ square frames around here in the six weeks. Now, with all that said, here’s a moodboard of where I’m going for the room. 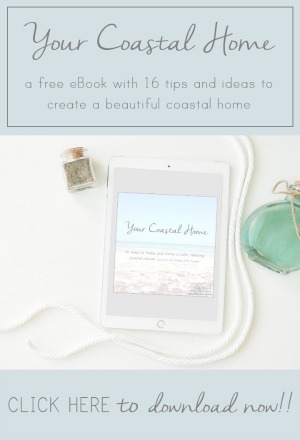 Light, airy, fresh, neutral, with a little traditional and a little bit coastal. I’ll be channeling my inner Joanna Gaines with some weathered and rustic finishes mixed with an array of textures (my favorite!). I’m most excited about the sconces, the rug, and those X-leg ottomans! Oh, and getting rid of that greeeeen! And yes, we have, and will continue to have, three forms of fans in this room…we live in south Texas :/ You can find all of my inspiration photos and product links on my Master Bedroom Refreshin’ board on Pinterest, I’ll be saving all kinds of stuff on there through this process! Now, to be honest, I do have about a week headstart on this but the bulk of it, and the hardest of it for me, the arranging of decor, is yet to be done. Procuring these items with coupons and discounts is a must for me too so I’ve got my eye out for some deals. I’m just really excited to finally focus on our space, and even the husband is on board for sprucing this room up. 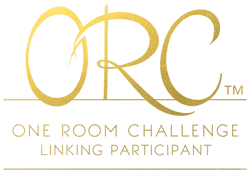 I’ll be back next Thursday to share the full to-do list and what progress I’ve made but in the meantime, be sure to see what the ORC designers are doing, along with my fellow Linking Participants, and follow #oneroomchallenge on social media. Huge thank you to Calling it Home for founding the ORC, this is going to be so much fun!!! Hi Emily, I like where you are going with this. I really think the 2 benches at the foot of the bed will look great and adding the extra “fluff” to the bed. I need to do that with ours. I know what you mean about the “heat”. We just recently moved from Dallas and it is hard to have lots of extra pillows and pretty covers/comforters on the bed when it is 115 degrees outside! 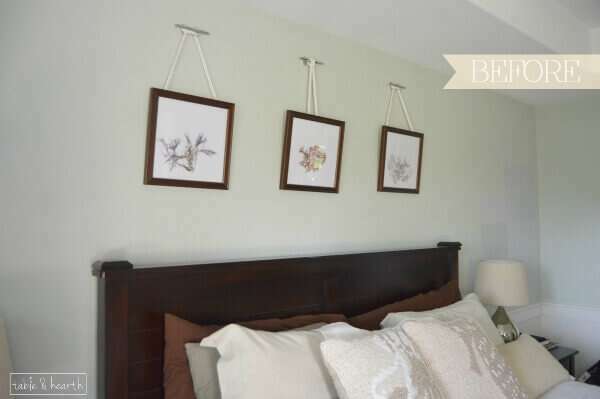 :-) But you want it to look pretty without having to dismantle the bed every night. Love the jute rug…I think it will add some great texture to the room. Looking forward to the next few weeks to see the changes! Excited to see the room transform!! It looks like this space is going to be beautiful! I hope everything comes together for you easy enough! Hi Corinna! Eeee, me too!! Thank you! Oh Emily! 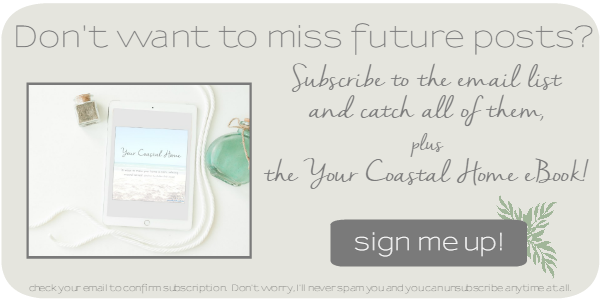 I LOVE, LOVE, LOVE your plans for the space! I’m so excited to be taking this journey with you!!! Thank you Kristi, can we just fast-forward to May already?? Aren’t you glad we have 6 weeks to pull off our makeovers? I’m loving your inspiration; the dark wood with light colors is going to be gorgeous! I’m just glad I tackled that wainscoting last year! ;) I’m a sucker for dark wood and light colors and fabrics Cindy! Thanks! It looks like you have some great pieces to start with! Looking forward to seeing how you pull it all together. Oh, and I live in Phoenix, so I totally get the need for lots of fans! We have 2 ceiling fans in our bedroom and they are on 24/7! Hi Sam!! I can imagine, two ceiling fans would be awesome! We’ve come so used to the fan sound at night that I have to have my noisemaker app on anytime we stay anywhere, can’t sleep in silence anymore. I just wish the floor and tabletop fans weren’t so dang fugly! Emily, I love the look you’re envisioning for your bedroom! Isn’t it painful to post those before pictures and put it out there for all to see? It looks like you’ve already made some great changes to the space – I’m excited to see the changes you have in store over the next 6 weeks! I am loving where this is going… Love the blue and the pattern on the bedding! Good luck pulling it all together, Can’t wait to see it when it’s finished! Great color scheme on the inspiration board. This bedroom will look great, can’t wait to see it. Eeee! Thanks so much for this Linda, it’s so exciting and so much fun to see what everyone does!! Love your inspiration board, Emily! 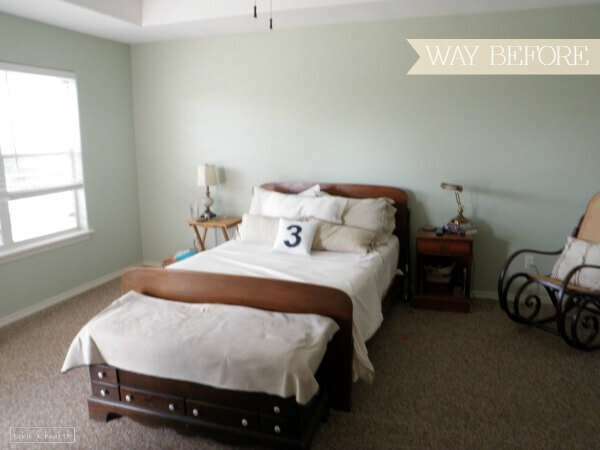 I love your bed… can’t wait to see what all you do in here! Excited to follow along and do this journey together! Love the ideas you’re throwing out there, especially the grey wall colour. I appreciate your struggle in finding the right shade. Grey can be so tricky, can’t it? I am eager to see the next phase of the transformation. Hi Gabrielle! Ugh, yes! The lighting in this room is sooo weird and in conjunction with that green, none of them looked like they should! I love what you’ve done with the space up to this point. The hardwood floors look beautiful. Can’t wait to follow the continued progress. Your new flooring looks really good, carpet is such a gross floor. I really like the wood color you went with! I would love to have the flooring in my bedroom look like that. Thanks! It was a handscraped laminate by Armstrong and it’s held up amazingly over the last 3 years!